This roofed dome is designed for hot, rainy climates. Domes are vulnerable to water damage, so what to do in rainy climates? I say add a roof. 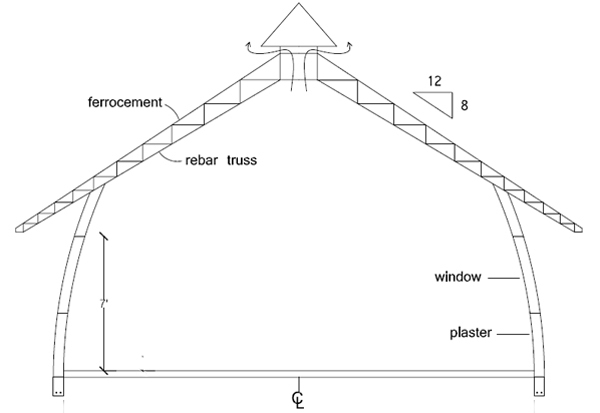 There are various roofed dome houses on our main website at EarthbagBuilding.com that you peruse here and here. Those are earthbag domes. The design I’m first presenting here is made of ferrocement. It’s just one more way to do things. Ferrocement domes are prone to overheating because they’re exposed to direct sunlight, so I added a roof with good sized roof overhangs, a sloped ceiling with roof vent so hot air will naturally escape through the top, and exterior cladding of plastered low fired brick. A ½” gap between the ferrocement and brick helps prevent overheating and moisture problems from driving rain. They make boats out of ferrocement, so you can make it as waterproof as you want. This takes good skills, workmanship and maintenance. I had an idea I call a ‘witches hat’ roof. Do an earthbag dome, insulate it however you feel like, but leave some attachment points protruding from the structure. Build a wrap around deck with a 4′ overhang. Starting from there, wrap a ring of metal roofing material (shingles or sheet, doesn’t matter),cover the top inch with something to let air thru that won’t wick up water. Overlap that material with the next layer up, repeat. Cap with acrylic dome, aluminum cone, something like that. Inspired by Owen’s Chum roof hobbit house design. What supports the metal roofing? Attachment points (wooden posts, rebar, whatever) protrude from the structure. Use reasonably solid insulation that can support the roof weight resting on it (papercrete, hyper-wattle). Yes I’m half the same person, it just shows up differently when I’m on the desktop or the laptop. Yeah, one vote. How’s your dome coming along? Any new videos? Obviously this design has more embodied energy than say earthbags and adobes. Although ferrocement uses less steel and cement than typical concrete structures and therefore is an option for sustainable builders, it still uses a lot of energy intensive materials. Ferrocement is probably best reserved for specialty uses such as vaults and curved roofs. An entire house of ferrocement would not be my choice. If someone is considering building an entire structure such as this out of ferrocement, I would suggest considering the entire wall and roof structure as one big truss structure. Built a large jig to lay out all of the rebar pieces accurately and weld them together. Then remove and repeat. A half jig would be sufficient. A jig that forms a truss that forms the rib of one gore complete with roof overhang, all the way down to the foundation. Then simply weld two complete trusses to the center ring and tip it up verticle. Brace it plumb, and then add two more truss ribs 90deg askew. A creative truss connection design at the center ring where the rebar can hook into the center ring would be very helpful. That would help stabilize everything as it is getting erected and welded. What about making trusses as I suggested, and linking them together the same way a reciprocal roof frame is formed at the center? I find myself wondering if each arched reciprocal truss will want to stay in place or if it will want to flop over until everything gets braced. I don’t have those answers, so if anyone attempts it, please be careful and do your homework. All that said, in my own humble personal opinion, an earthbag roundhouse makes a lot more sense. It’s difficult or even impossible to get code approval for earthbag buildings in many areas, so it’s good to have alternatives. Also, there are cultural issues involved. Some areas most likely would not use earthbags due to their local building traditions. The area I had in mind only builds with concrete, steel, low fired brick and cement plaster. Trying to convince the builders to use unfamiliar materials would be a long, fruitless endeavor. The walls could be built separate from the trusses to speed construction. One crew could be building the walls, while another crew made the trusses. Every truss would be made in a jig so they’re all identical. Also note, they could be curved for added visual appeal. I suggest using a compression ring where trusses meet at the roof vent. A section of pipe with welded brackets would work nicely (= low cost and simple). Support the compression ring with scaffolding and braces as the trusses are attached one at a time.